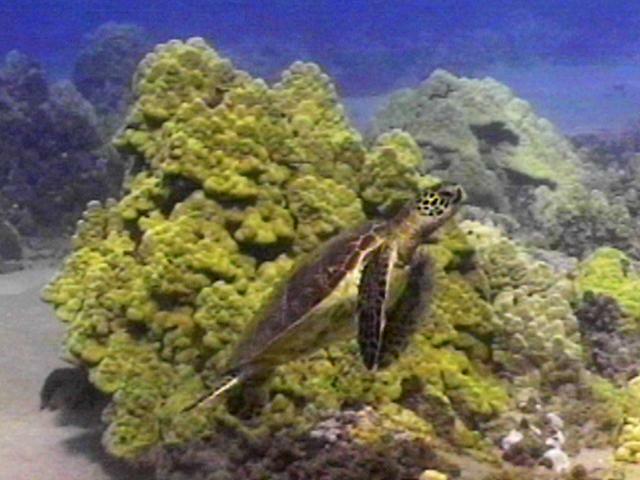 Our dive logs show that in late July we'd noticed a little honu with her shell sticking out of a coral head. This week, we passed the same location and the teeny tiny turtle was there again. This time she poked her head out and looked us over. She seemed torn between curiosity and caution. She was as beautiful as she was tiny. She circled, head turned in our direction, waiting to be pursued. That didn't happen. Satisfied, she eventually lifted for air and swam slowly away. She was as beautiful as she was tiny. Our most recent sighting was magic. It was a late afternoon dive, the sun throwing gold through her electric blue water, and she was resting beside her ledge much like a kitten would enjoy sunbeams. She watched our approach. Ursula swam away from her and pretended to be interested in the sand and coral rubble. Peter videotaped, and this time the teeny tiny turtle approached and swam close enough for a profile--identification. Teeny tiny turtle is now entered in our logs as 1998 # 72. We decided she was so special, however, that we went to our Hawaiian dictionary and named her as soon as we dried off from the dive. There is no Hawaiian translation for "Teenytiny" so we had to go to a backup. Very easy actually--we named her Le'a, Hawaiian for "delightful." 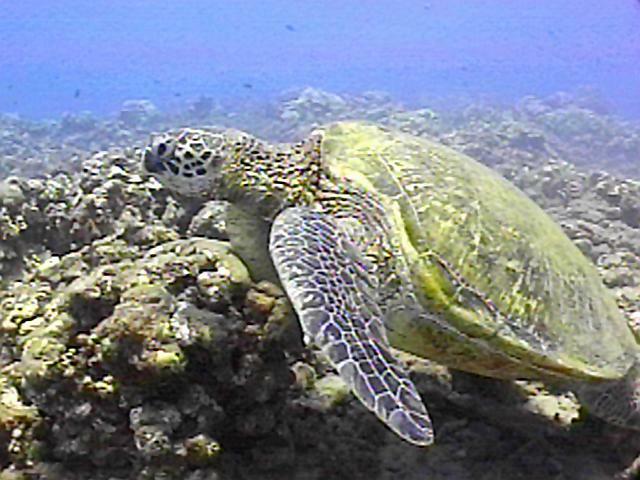 When honu squabble, it's almost always over real estate. On our second dive on August 6, however, we witnessed the most protracted quarrel between two turtles that we've ever seen-and it was all over a little piece of rock. Normally, turf wars are about places to rest: one turtle is lying in another turtle's favourite spot. This one was different. It was over a piece of rock that both turtles wanted to scratch against. Yes, turtles like to scratch, or at least, rub themselves against rocks and ledges. Tiamat is a reasonably large mature female. (We know this because she sports tags, one of them reading 122C.) Pu'u (Hawaiian for "bug" because she likes to) is a medium-sized subadult who often rests beside Tiamat. On this day, though, they weren't resting. As we arrived at the Resting Site, we could see that Tiamat and Pu'u were having a disagreement, but it wasn't immediately obvious why. We hadn't been there more than a minute when it looked as though we had a winner. Tiamat delivered a headbutt and Pu'u departed for air-but not quietly. She gave us an impressive display of temper, featuring numerous flipper swipes and various body contortions, most of it directed towards Tiamat but some thrown our way for good measure. At this point, we got a hint as to the cause of the fight. Tiamat began rubbing herself against a projecting rock. In fact, she looked much like a cat does when it rubs against something that it feels possessive over. We watched as Tiamat scratched herself a bit, then she too lifted for air, passing a descending Pu'u as she left. Pu'u was still in foul temper, giving Tiamat a flipper and then giving us a couple too. She then headed for Tiamat's scratching rock. As soon as she landed, she too began the cat-like rubbing. We were intrigued, and since it was highly likely that Tiamat would return shortly, we sat back to see what would happen next. Sure enough, Tiamat showed up a couple of minutes later. She was not about to let Pu'u have the rock. She hovered over Pu'u for a moment, then whapped her with a flipper. Now, Tiamat is twice the size of Pu'u, so a flipper whack is strong incentive to move. Pu'u tried to stand her ground, but Tiamat turned and threatened a headbutt. This was too much, Pu'u admitted defeat and gave up the rock. She moved a couple of metres away and settled down again, glaring at Tiamat all the while. We had a winner. The odd thing is that Tiamat retained possession for no more than another minute or two, then moved a few metres over to her normal resting spot. Apparently, Pu'u wasn't interested in the abandoned prize. When we left a few minutes later, she still hadn't claimed it. In that respect, turtles are a lot like cats and humans!